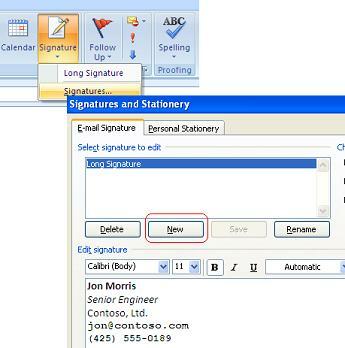 How do I create a signature to be included in outgoing messages in Microsoft Office Outlook 2007? 1. Run Outlook and open a new message window. 2. Click the signature icon on the new message window and select the "Signatures..." command. The "Signature and Stationery" dialog box shows up. 3. Click the "New" button on the "E-mail Signature" tab. Outlook prompts for the name for the new signature. Enter "Long Signature" as the name.